Zone 0: The wet season officially ended at the end of April and the sea surface temperature is below 27 deg C so that is the end of the cyclone season for this year. The humidity is decreasing and the mould will stop growing in the bathroom. Zone 1: If you haven’t planted all the European style annual vegetables this is the best time to do it. The later wet seasons in the last couple of years have meant that early plantings have been washed out or suffered from a fungal attack. It is important that all soil is covered with mulch or green manure crops as the soil dries out very quickly in the dry season. Dichondra and Gotu Kola work beautifully and will survive the dry season. Keep the fertiliser up using a little often. Compost or organic pellets are both slow release options. 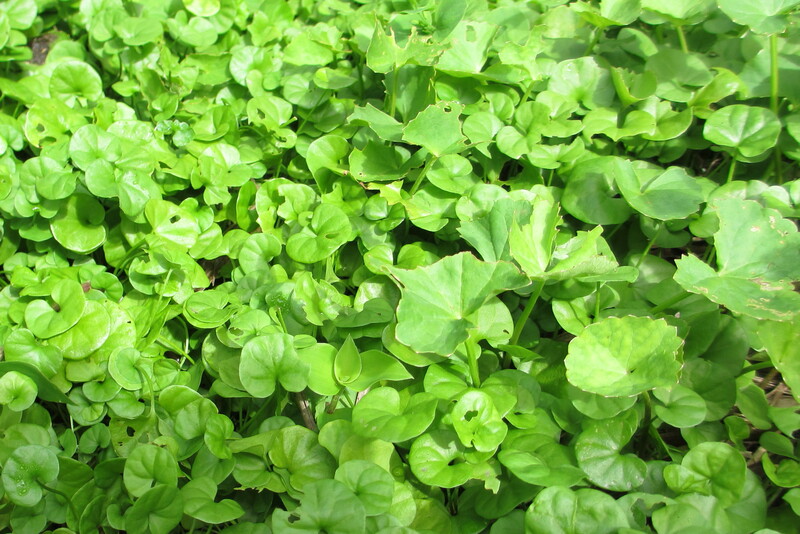 Beans like a sprinkle of lime before planting and beside the young plants after germination. A little sprinkle over the plants seems to deter the bean fly. Watering is best done by an irrigations system which has holes at intervals and the plants to match the holes. If hand watering, use low water pressure and put the hose under the mulch near the plants which keeps the water off the plants and in the ground where it is needed. Zone 2: Keep the water and fertiliser up to this area. Succession planting of crops will ensure a long harvest period. Better to have 2 cobs of corn a day than 50 in one week. Zone 3: Fertilise fruit trees with sulphate of potash to keep the fruit growing and sweet. Mandarins that have been under fertilised will be woody and tasteless with little juice so use the sulphate of potash and Epsom Salts. Zone 5: Deeply water any trees in this area if they need it. Allow them to be stressed for water a little to encourage a good deep root system. This increases their resilience and also their wind resistance. The Lillypillies are flowering and fruiting so harvest and make jams, jellies, juices or just enjoy the tart freshness. Prune when harvesting to shape the tree or reduce overhang over the road or footpath. The highlight of the permaculture year is the first Sunday in May as many permaculture gardens are open to the public as part of Permaculture Day. 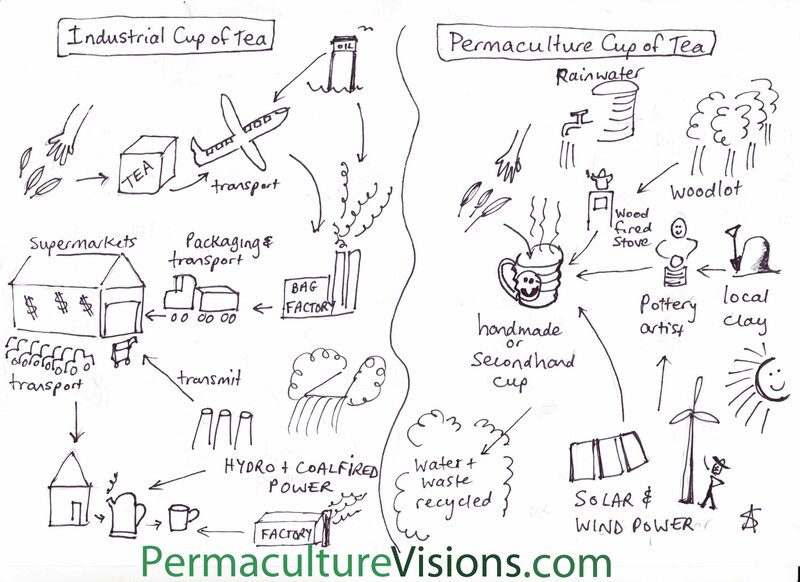 Although it is not the prettiest time to view a permaculture garden, it is generally a slow time and enables us to chat and reflect. Zone 0: More herbs are being brought inside to hang and dry to use over winter. The solar hot water radiators work well in this shoulder season to take the edge off the cool afternoons, but when it gets cooler than 15 deg C we fire up the fuel stove and have a well deserved cup of tea, permaculture style, with gorgeous locally made pottery cups and fresh herbs from the garden and local honey. Zone 1: Winter vegetables can be slotted into the intensive garden beds. We keep all the roots of old crops in place to help protect our soft compost layers. Our supply of commercially cut lawn clippings is slowing down and this resource is now treasured and used to cover any bare patches to protect them over winter. The solar oven is handy at this time of year. It is an easy way to cook, no stirring, no burning, no cleaning, no wastage and best of all, the flavour is rich and hearty. We also have a solar kettle and this gives us a hot late morning cuppa. 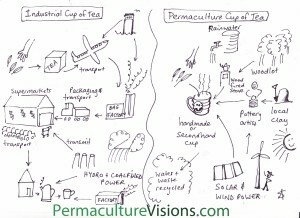 The illustration below is a comparison of a permaculture cup of tea and an industrial cup of tea. Zone 2: The leaves are starting to fall, the greens are slowing down, the eggs are in short supply and the last chicks have hatched. Our pumpkin recipes are getting a thorough review. Pumpkin and polenta pie is popular and easy to make. Zone 3: A few Dragon fruit, Davidson plum and Monstera Deliciosa are ripening alongside the plentiful citrus fruits. The chillies and bananas are still going strong. It is time to pick the Jerusalem artichokes (Helianthus tuberosus) and their cousin, the Yacon (peruvian ground apple). The harvest is ready to dig and sit in the sun to sweeten for a just a couple of days. The worm farms are hungry, so we can pick a number of weeds to feed them. Using the permaculture principle of multiple-uses for each function, we pop winter vegetable seeds in the disturbed soil. Zone 4: The wind and cool temperatures cause a bit of havoc at this time so, we turn the problem into the solution and have lot of sticks to use in the wood-fuelled ovens. Zone 5: Remove vines from new plantings and now that the heat has gone we start planting out native tree seedlings that were removed from the intensive beds in summer and nursed along ready to replant later.